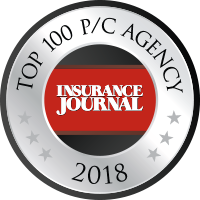 ORLAND PARK, IL - SEPTEMBER 12, 2018 – Insurance Journal officially announced its Top 100 Property/Casualty Agencies with Horton Group ranked at #42 for 2018. This prestigious ranking is based on brokerage revenue generated by U.S. - based clients. Insurance Journal is considered one of the nation’s most comprehensive and respected insurance publications. It ranks and publishes the performance of U.S. insurance agents and brokers annually. For 2018, Horton continues to climb the ranking ladder by five spots from #47 in 2017 to #42. “To be successful means growing, profitable and always getting better. To grow and be profitable is the only way an agency can remain independent. Always getting better refers to how we operate the business and always seek to provide a better customer experience. And our clients' success will continue to drive us in our innovation and ensuring continuous execution.” said Dan Horton, President and Chief Sales Officer of the Horton Group. “It’s our vision to be successful, good and passed to future generations. This distinguished ranking truly speaks to the level of care we put into the customer experience, servicing platform, and our organization’s future. With this three-fold focus in mind, it enables us to continually be successful, good and passed to future generations,” said Glenn Horton, Chief Executive Officer of the Horton Group.